New research from the Institute for Women's Policy Research shows inequality in access to paid sick days by race/ethnicity, supervisor status, occupation, and earnings level. Only half of workers with paid sick days took any last year. 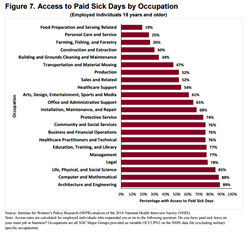 This new research shows how the lack of paid sick days contributes to inequality in our nation. At the same time, workers’ use of paid sick days, when they have them, is incredibly modest overall. New analysis by the Institute for Women’s Policy Research (IWPR) finds that four in ten workers in the United States lack access to paid sick days, and among those who do have access, only 55 percent of workers actually used any sick days in the previous year. Inequality in access to paid sick days exists within and across occupations, with supervisors more likely to have paid sick days than non-supervisors. Hispanic, low-wage, and food service and personal care workers are least likely to have access to this important benefit. The lowest earners are the least likely to able to take a day off with pay when they are sick, yet they are least likely to have paid sick days. Only one in five (22 percent) of those earning less than $15,000 a year have access to paid sick days, whereas nearly nine in 10 (86 percent) of those earning $65,000 or more have access to paid sick days.